Manuscript lines. 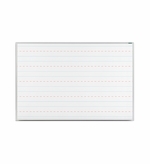 OptiMA has a number of dry erase options and different writing surfaces with permanent penmanship lines or manuscript lines printed onto them. We recognized that a lot of the manuscript boards and prints available in the market place really didn't work because they didn't leave a space between the bottom of one set and the top of the next set or row so there was no where for the student to come down below the line for letters such as g,j,p or g so we made sure that our design actually works. 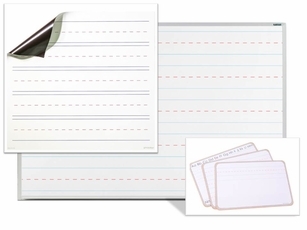 We cover all of our printed manuscript lines with our exclusive clear dry erase writing surface that accepts either damp erase or dry erase markers and with proper care and minimal maintenance the writing surface will last for years, erase clean every time and never ghost. 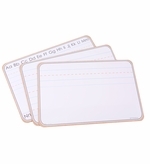 Be sure to check out our magnetic roll up prints. 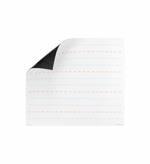 This is a great tool to be able to pull out of the closet when it's time to practice or teach penmanship or writing to your students and then when that lesson plan is over you can clean it off and roll it up and store it back in the closet for next time. All products can be customized to meet your needs and they are all proudly made in the U.S.A. School purchase orders are gladly accepted. From "Choose Size" "406: 4'Tall x 6' Wide (+$299.95)" "408: 4'Tall x 8' Wide (+$359.95)"
Three different manuscript designs. 9 x 12 and 12 x 18, Double Sided. From "Select Option" "MAN1-DS: 9x12 Single Manuscript (+$3.95)" "MAN2-DS: 9x12 ABC with 2 Sets (+$3.95)" "MAN3-DS: 9x12 Triple Manuscript (+$3.95)" "" "MAN1-LG: 12x18 Single Manuscript (+$9.95)" "MAN2-LG: 12x18 ABC with 2 Sets (+$9.95)" "MAN3-LG: 12x18 Triple Manuscript (+$9.95)"
From "Select Size" "404: 42\" Tall x 44.5\" Wide (+$109.95)" "406: 42\" Tall x 68.5\" Wide (+$159.95)" "408: 42\" Tall x 92.5\" Wide (+$199.95)"
From "Select Size" "104: 10.5\" x 44.5\" (+$29.95)" "106: 10.5\" x 68.5\" (+$39.95)" "108: 10.5\" x 92.5\" (+$49.95)"